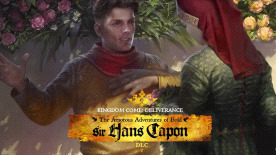 The second DLC "The Amorous Adventures of Bold Sir Hans Capon" for Kingdom Come: Deliverance revolves around his attempts to woo the fairest maid he has ever set eyes upon, and his success will not depend only on his own mastery of the art of love - it's also up to his trusty wingman, you - Henry, to ensure that The Amorous Adventures of Bold Sir Hans Capon come to a happy end! That's the main objective linking three new quests, in which you will not only have to read love poems, arrange a nighttime tryst and keep an enraged butcher at bay, but also infiltrate the camp of a band of bloodthirsty brigands, enter a dice tournament, dig up a corpse, investigate a murder and... er... perhaps commit a few. All for love, of course! Specification are for the main game, the DLC is very small.